Virteom Launches Brolex Builders and Findlay Roofers! 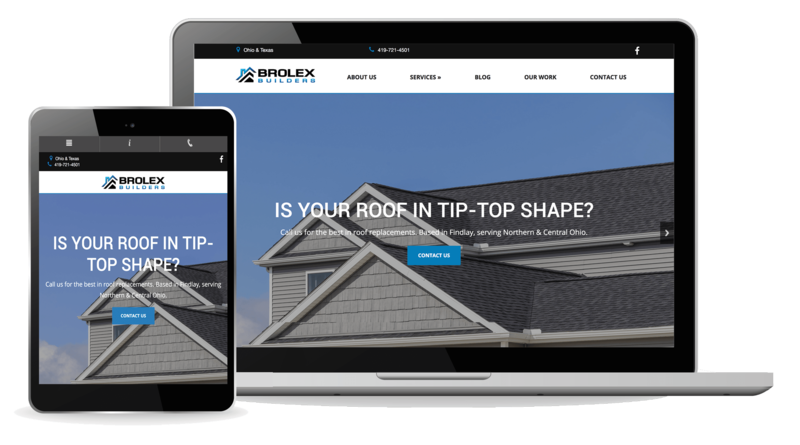 Virteom is excited to announce the launch of two new websites: Brolex Builders and Findlay Roofers. Brolex Builders is a roofing and general contracting company located in Findlay, OH. Their roofing business, Findlay Roofers, services all of Northern and Central Ohio. Virteom was brought on to help establish a better presence online for both of these companies. We begun our relationship as we encourage all, through discovery: cross analysis, persona development and site mapping. Through our discovery process we were able to put together a guided strategy to allow their website to connect better with their customers on a more personal level -- ultimately compelling them to convert. Findlay Roofers started as a one-page scrollable website. We encouraged this buisness owner to spread his content across many pages, giving users ample opportunity to land on their website. These websites represent different segments of the client’s business. The owner of Brolex Builders wanted to distinguish Brolex Builders as a general contracting company, and Findlay Roofers as the roofing company. Each company should be contacted for the type of work they offer. We were able to clearly lay out what type of work each company offers on the homepages, service menus, and sub-menus. Visitors have a clear path on these services and how to contact the company if they’re interested in these service offerings. It was important to include information about the company, BBB accreditation, GAF certification and location information so that visitors knew that this business could be trusted, and how to contact them. The client’s old sites were receiving a lot of traffic, but he wanted to give the sites a more of a modern, professional look. At the same time, he didn’t want to sacrifice SEO or his rankings on search engines. Virteom encouraged the business owner to expand upon all the content he was already ranking for to expand his reach. Days after launching on a new CMS, Findlay roofers still remains among the first page of organic search rankings for ‘roofers in Findlay Ohio’, ‘roofing in findlay’, and ‘findlay roofers’. As we mentioned, this client’s vision is to keep their website on the first page of search engine’s result pages (SERPs). In order to do that, they will need a full team behind them driving traffic to their site through social media campaigns, email marketing campaigns, and content marketing. Virteom can do just that! We don’t leave you in the dark post-site launch. Especially if you add-on our marketing and sales automation tool, TouchConvert. Want a site like Brolex Builders or Findlay Roofers? It’s easy! Just chat with us (bottom-left), give us a call, or fill out the form on the contact us page. Our team is looking forward to getting started with you! Off to the next project! !